At the end of the nineteenth century and into the early twentieth the Jews of Europe found themselves standing on a precipice. Persecution, both state sanctioned and otherwise, was making life intolerable. Simultaneously advances in technology, most notably in transport and mass communications ensured that there were escape routes available such as had never existed in the past. It was at this time that the USA was accepting huge numbers of immigrants leading to a mass migration of Jews to the New World. But this was also a time of ideology, when people all over Europe were discovering and creating ideas that would supposedly lead them out of their dire existences and usher in a utopian age. 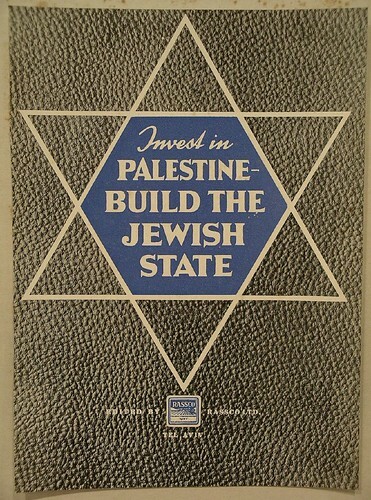 Into this intellectual melting pot Zionism was born. 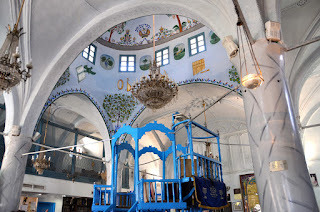 It was a radical concept with its origins in the ancient attachment of Jews to a biblical homeland combined with the need for an answer to the very current issue of Jew hatred. The idea was to create a place that Jews could call home. In their home Jews would be finally be masters of their own fate, no longer relying on the good will of the native populations who had historically persecuted them. They would find safety through sovereignty. When Zionism was floated officially at the First Zionist Congress in 1897 the land intended for the homeland was sold as an empty land. A place just waiting for the Jews to return. “A land without a people for a people without a land” was a common slogan used at this time. 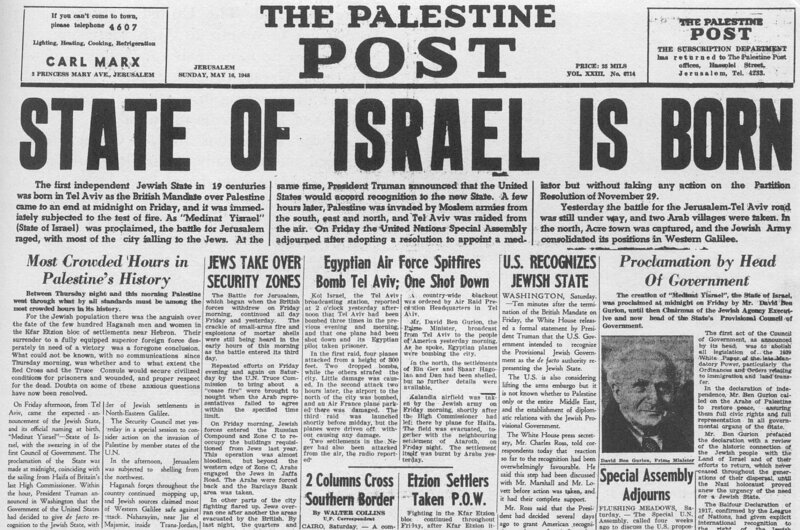 When it became clear that this wasn’t the case Zionism sold itself as an ideology that would be good for both the Jews and the native Palestinians. But the native Palestinians didn’t see it that way. There were violent disturbances already in 1919 when Jews composed less than 10% of the populace. From the moment Jews began immigrating to Israel in large numbers there was resentment from the indigenous Arabs who understood that they had no role to play in the Zionist utopian vision for the future of Jewry. The stage was set for a clash between a people determined upon auto-emancipation and a native populace determined to stop them. War was inevitable and to the victor would go the country. Fast forward to 2014 and we can see that Israel has provided the Jews with a voice in the UN, embassies around the world and an army to protect them. But Israel can also be viewed in the opposite light. As an occupier, a colonial oppressor, a foreign body in the Middle East that continues to rule over both Palestinians in the West Bank and within its pre-1967 borders without any liberal democratic values in sight. This all begs the question; how does Israel move forward towards a peaceful future with Palestinians while supporting liberal democracy? There are decades of hate and mistrust that have built up between Palestinians and Israelis, Arabs and Jews in this land. To argue that Israel will be able to sign a document on the White House lawn and simply magic all of those feelings and fears away is wishful thinking. As is to argue that both Arab and Jew living in the area of land that includes Israel and the West Bank should live in the same country. To tell the Jews to give up on their sovereignty is to ignore the reasons they brought Israel into being in the first place. The settlement building that has been ongoing in the West Bank for decades now is critical to the discussion as to how to move forwards. To allow the continuation of settlement building in the West Bank is tell the Palestinians that they are going to live under occupation forever. It is to push them towards terror organisations and undermine peace efforts. Israel needs to do the opposite, show Palestinians that it is interested in peace making, that there is hope for them moving into the future. Settlement building has presented the single greatest obstacle to a future Palestinian state coming into being. To expect Palestinians to believe that Israel is serious in negotiations while simultaneously building on the very land they’re negotiating over is insanity. Therefore the first step forward should be preventing all settlement building. The next is to remove settlements that currently exist. 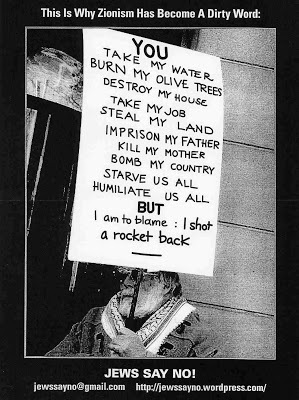 Particularly those which ensure significant hardship to the lives of local Palestinians. This is particularly true in Hebron. To move too quickly is to invite disaster. At a time when Hamas and other militant Jihadi organisations are strong simply withdrawing settlers and soldiers from the West Bank would be to leave them free to attack Israel, inviting the inevitable response. However with the removal of settlers the army would be able to significantly scale back military activities since there would be very little in the West Bank that needed to be defended. Less checkpoints, jeep patrols and other invasive policies would allow the Palestinians to breathe freer air. This lack of military activity would be a clear statement of intent from Israel and would provide something concrete for Palestinian moderates to point to when calling for peaceful relations with Israel. Such activities would strengthen the Palestinian Authority and weaken Hamas and other Jihadi movements. This would create the environment necessary to move forward with the creation of a Palestinian State in what is now the occupied West Bank. It isn’t pretty, but it is a lot more realistic than other solutions. - Marc was born and bred in London and now lives in Tel Aviv. He makes a living as a copywriter and publishes short stories and articles. After immigrating to Israel from England, Marc served for 2 years in the Israel Defense Forces (IDF). He is working on a book about his service in the IDF during the Al Aqsa Intifada. I have to admit I find myself frustrated replying to the rhetoric of Zionist Left. It is strange and difficult to answer people who speak, often elegantly, about what is best for others with whom they have never even entered into conversation. They know of Jewish persecution, of daily life under the threat of terror, but have little idea of what it means to live as a Palestinian under a Zionist government. It's not just that they haven't seen how Palestinians live in the refugee camps of the West Bank or Gaza, most Zionists have little idea what life is like in Palestinian East Jerusalem, officially annexed to Israel but largely without sewage system and basic services. Nor even of what life is like for those Palestinians who remained within what became the state of Israel and received citizenship. The "Israeli-Arabs" have had the vast majority of their lands confiscated, leaving them in what are still called 'villages' but look much more like depressed urban ghettoes, often locked into cycles of poverty and crime. Given the right to vote and have representation in the Israeli parliament, Arab parties have never been invited to join any government coalition, and thus have had little or no power in the allocation of land and budgets, least of all in shaping their country's relations with its neighbors and occupied people. Living within a state that defines itself as Jewish and Palestinians as its enemy, these people who constitute some 20 percent of Israeli citizens are seen by Israeli governments as a security and demographic threat. That this has little to do with actual allegiance can be seen in the case of the Negev Bedouins, whose service in the Israeli army does not help when they get their villages razed and land confiscated in an attempt to herd them into government-approved townships. The Zionist Left generally tries to reduce the political problem of today to the West Bank. Even here, the suggestions made for the evacuation of isolated Israeli settlements would only create a Palestinian Bantustan without access to what used to its urban center in East Jerusalem, without control of its own borders, airspace or water resources; in the best case a fate slightly worse than that suffered by Palestinian Citizens of Israel. Those on the Zionist Left, who generally speak highly of human and civil rights, seem to think they are doing some sort of charity in giving Palestinian limited autonomy, or in giving those of them who have Israeli citizenship formal participation in the political process. 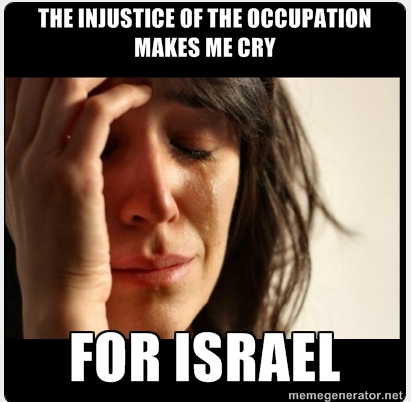 When it comes to Palestinians they seem to forget their own tenets of basic human equality. Their view of their neighbors is clouded with what they perceive as the threat to the Jewish state, and therefore they are never seen, really, as fellow humans. When you say a limited Palestinian autonomy in those parts of the West Bank not yet overrun by Israeli settlements "Isn't pretty but it's a lot more realistic than other solutions", what you actually mean is, that's the best we can do because there is no way we are giving up the Jewish State, the huge political and economic inequality between Jews and Arabs between the Jordan and the sea. Zionism, which stemmed from the plight of a persecuted people in Europe, has become the oppressor of those people whose land it settled on. Dangers facing the Jewish people -- real, perceived or manufactured -- are used to defend this oppression and discrimination. In Israel, challenging the necessity and justness of maintaining a Jewish state makes one a radical. the suggestion that a state must treat equally all the people under its control is seen as extreme. Those who are truly interested in human freedom and equality will be forced to consider more radical changes. Not so much in terms of political solutions but first in terms of the way we think of our Palestinian neighbors. Our first challenge in forging a better shared future is in knowing each other. Achieving at least a basic awareness of the plight of the other that would allow us to imagine ourselves in their place. We might remind those who want a Jewish state of the great Jewish sage who said that 'love thy neighbor as you love yourself' is the key tenet of Judaism, and that the Hebrew Bible insists over and over again that we must love the stranger, for we were strangers in Egypt. We might turn also to more recent Jewish history of being an oppressed and discriminated against minority. I have some experience trying to relay some of this to the Zionists who are my family, friends and neighbors. As noted at the beginning, this most often leads to frustration. I have found that in order to have this discussion in a useful way its best to start with a visit to a Palestinian neighborhood, with meeting Palestinians and the conditions in which they live in today's Israel. It is best, if possible, to try to have a conversation about the future of this country together, as equals. in my experience, such discussions rarely lead to proposals of partial pull outs and limited autonomy.